I picked up the ‘Towns and Country’ Moleskine from @Documentally at a recent Tuttle and whilst Im no artist I felt the pictures described in words along with my rather child like depiction of a train should convey my sentiments of rail travel for the modern blogger. 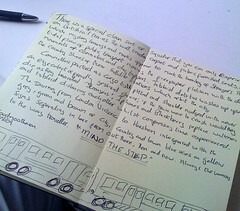 Im taking the book back into London today ( on the train ) and hoping to hand it on to the next contributor. Im looking forward to seeing the finished article and to being able to say I contributed , if only a little bit.